The purpose of Freedom Over Addiction (FOA) is to help addicts break the cycle of addiction and return to a successful life. We use a comprehensive approach, which includes: mentorship, accountability, weekly support groups (for addicts and families), special educational curriculums, 12-step principles, and referrals into live-in programs. When a loved one is bound by addiction, their entire family suffers. 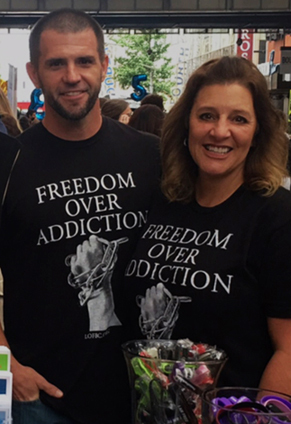 Freedom Over Addiction not only provides overcoming faith for the addict, but we help advise and equip their families with support, training and tools to live above the chaos and pain. Having had their lives broken apart by things like addiction, abuse, or poverty, many wander our streets homeless, hungry, and hurting. Our "care team", brings love, clothing and basic necessities to the homeless, while networking with agencies that are committed to ending the plight of homelessness. Having successfully overcome 20 years of "rock-bottom" addiction, Brandon Fultz is ready to help other men do the same! No addiction is too big or small for the power of God. Brandon's wife Senta has also overcome addictions and she has a heart to help other women do the same. Together they serve as living testimonies of God's mercy and grace!